His Divine Grace A. C. Bhaktivedanta Swami Prabhupada was born in 1896 in Calcutta, India in a family of pure Gaudiya Vaishnavas. At 5, he organized a children’s Ratha Yatra to glorify Lord Jagannatha in the neighbourhood, foreshowing his divine characteristics. He would absorb himself in Lord Radha-Govindaji’s beauty at the nearby temple, worshipped small deities of Radha-Krishna & quickly learnt mridanga & harmonium for glorifying the Lord. At 26, He first met his spiritual master, Srila Bhaktisiddhanta Sarasvati Gosvami Thakura, in Calcutta in 1922. Bhaktisiddhanta Sarasvati, a brilliant devotional scholar and the founder of sixty-four branches of Gaudiya Mathas (Vedic institutes), liked him, & at their first meeting, requested Srila Prabhupada to broadcast Vedic knowledge through the English language. Srila Prabhupada became his student, and eleven years later (1933) at Allahabad, he became his formally initiated disciple. 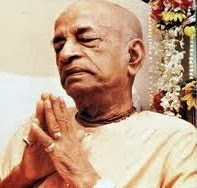 In the years that followed, Srila Prabhupada wrote a commentary on the Bhagavad-gita and in 1944, without assistance, started an English fortnightly magazine “Back To Godhead”. 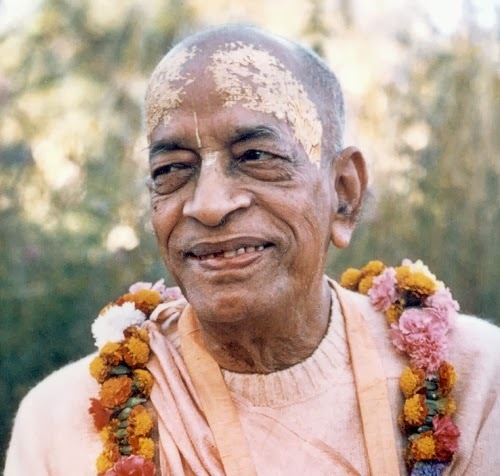 Recognizing Srila Prabhupada’s philosophical learning and devotion, the Gaudiya Vaisnava Society honored him in 1947 with the title “Bhaktivedanta.” In 1950, at the age of fifty-four, Srila Prabhupada retired from married life, and four years later he adopted the vanaprastha (retired) order to devote more time to his studies and writing. He lived austerely & used practically all his money for printing literature. Once while selling Back to Godhead in Delhi’s summer, he collapsed on the street from heat stroke. However, he continued undeterred in his preaching mission. Later Srila Prabhupada traveled to the holy city of Vrindavana, where he lived in very humble circumstances in the historic medieval temple of Radha-Damodara. There he engaged for several years in deep study and writing. He prayed for & received the blessings & guidance of the exalted acharya Srila Rupa Goswami. He accepted the renounced order of life (sannyasa) in 1959. At Radha-Damodara, Srila Prabhupada began work on his life’s masterpiece: a multivolume translation and commentary on the 18,000-verse Srimad-Bhagavatam (Bhagavata Purana). He also wrote Easy Journey to Other Planets. 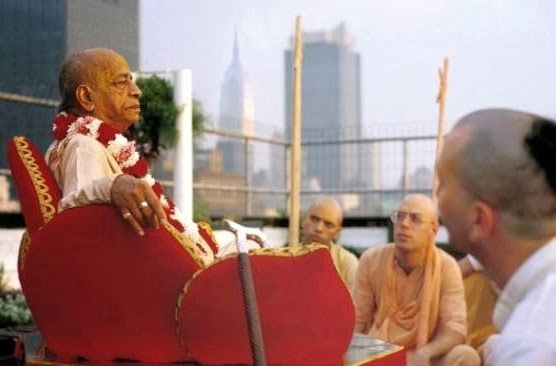 After publishing three volumes of Bhagavatam, Srila Prabhupada came to the United States in 1965, to fulfill the mission of his spiritual master, braving 2 heart attacks during the forty day sea journey. Srila Prabhupada was practically penniless -he simply relied on firm faith in the instructions of his spiritual master & the power of Krishna’s holy name. It was after almost a year of great difficulty that he established the International Society for Krishna Consciousness in July of 1966. Under his careful guidance, the Society grew within a decade to a worldwide confederation of almost one hundred asramas, schools, temples, institutes and farm communities (and is still flourishing & expanding). In 1968, Srila Prabhupada created New Vrndavana, an experimental 1000+ acre Vedic community in the hills of West Virginia. Inspired by the success of New Vrndavana, his students founded several similar communities in the United States and other countries. In 1972, His Divine Grace introduced the Vedic system of primary and secondary education in the West by founding the Gurukula school in Dallas, Texas. From three children in 1972, the school’s enrollment had grown to one hundred fifty by 1975. Srila Prabhupada also inspired the construction of a large international center at Sridhama Mayapur (birthplace of Lord Chaitanya Mahaprabhu) in West Bengal, India, which is also the site for the upcoming Temple of Vedic Planetarium (world’s largest temple). A similar project is the magnificent Krsna-Balarama Temple and International Guest House in Vrndavana, India. These are centers where Westerners can live to gain firsthand experience of Vedic culture in the spiritual Dhama environment (Lord’s abode). In 1974, he inaugurated Food For Life, which has since then become the world’s largest vegetarian food relief program, serving upto 3 million meals daily, including emergencies like earthquakes, floods, cyclones, etc. In 1975, he founded the Bhaktivedanta Institute, a scientific branch of ISKCON, which has since then actively promoted dialogues & conferences on Science, Spirituality & Religion, enabling the scientific community appreciate Vedic wisdom. Srila Prabhupada’s most significant contribution, however, is his books. His Divine Grace wrote over eighty volumes of authoritative translations, commentaries and summary studies of the philosophical and religious classics of India. Highly respected by the academic community for their authoritativeness, depth and clarity, they are used as standard textbooks in numerous college courses. His writings have been translated in upto 75 widely spoken languages. 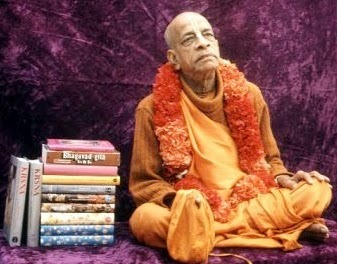 The Bhaktivedanta Book Trust, established in 1972 exclusively to publish the works of His Divine Grace, has thus become the world’s largest publisher of books in the field of Indian religion and philosophy with cumulative distribution of over 500 million books. In the last ten years of his life, in spite of his advanced age, Srila Prabhupada circled the globe twelve times on lecture tours that took him to six continents, barely resting 2-3 hours a day. He also established over 100 temples which (apart from new ones) continue to provide peace & inspiration to locals. His lectures, conversations and rendition of Vaishnava songs & prayers have been carefully recorded & continue to provide enlightenment & purification to people (especially followers) all over the world. He initiated about five thousand disciples from different nationalities across the world. In spite of a vigorous travel schedule, Srila Prabhupada continued to write prolifically. His writings constitute a veritable library of Vedic philosophy, religion, literature and culture. Srila Prabhupada was not an ordinary person. He was personally chosen and empowered by the Supreme Lord to spread Krishna consciousness and chanting of Hare Krishna all over the world, as also confirmed in the Brahma Vaivarta Purana*. As one of the world’s most dynamic religious and cultural movements, ISKCON has more than six-hundred temples & centres worldwide today. Later in 1996, to commemorate the centennial of Srila Prabhupada’s appearance, the Government of India issued a postage stamp honoring him as the emissary who spread the glory of India, the message of Lord Krishna, around the world. 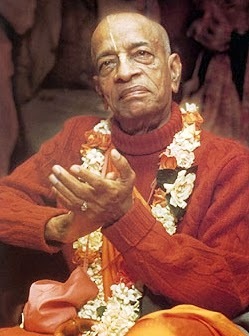 His Divine Grace A.C. Bhaktivedanta Swami Prabhupada ki Jai! *In the Brahma-vaivarta Purana, in a conversation with Ganga Devi, Lord Krishna describes that after 5,000 years of Kali-yuga have passed, His mantra upasaka, the great sage and worshiper of Krishna’s holy names, will appear and spread the chanting of Krishna’s names (in the form of the Hare Krishna mantra) not only in India but throughout the world. Vaishnava Bhajans, Homages, Prasadam offering to Srila Prabhupada, Pushpanjali, Arati & Prasadam distribution.